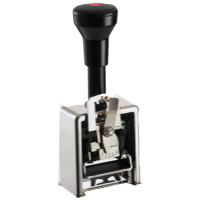 Designed for standard light-duty office applications. 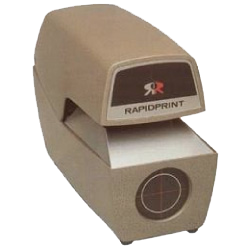 Fast, reliable and self-inking. Available in 6 or 8 wheels. 4.5 mm high numbers in a Roman font. Nine different actions; consecutive and repeating up to 20 times. Comes with a high impact black plastic frame. For everyday use. Fast, reliable self-inking. 6 or 7 special alloy metal wheels. 3.2mm (1/8″), 4.8mm (3/16″) or 5.6 mm (7/32″) characters in Roman or Gothic font. Five different actions; consecutive and repeating up to 4 times. Metal frame. 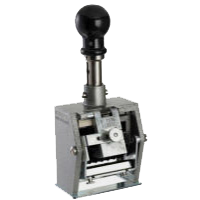 A sturdy, heavy-duty, fast and reliable self-inking machine. 8 to 10 special alloy metal wheels. 3.2mm (1/8″), 4.8mm (3/16″) or 5.6 mm (7/32″) characters in Roman or Gothic font. 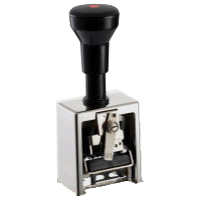 A sturdy, heavy-duty, fast and reliable self-inking machine. 11, 12, 13 or 15 special alloy metal wheels. 4.8mm (3/16″) characters in a Gothic font. 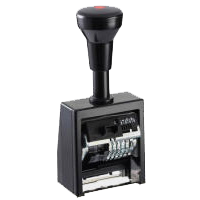 A sturdy, heavy-duty, fast and reliable self-inking machine. 6 to 8 wheels with rubber faces. Can be customized up to 15 wheels. 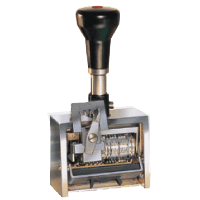 6-wheel machines are available in a 4.8mm (3/16″), 5.6mm (7/32″) or 6.4mm (1/4″) Gothic character. All other wheel number configurations available in a 4.8mm (3/16″) Gothic character only. Whenever sequential numbering is required. Many options available for your application. Duplicate action, repeat switch and code wheels. Solid-state circuitry controls both the number advance and assures consistent impressions. A number is stamped each time a document is inserted, then advances automatically. Rugged die-cast case has a sturdy lock to prevent tampering. Solid brass type wheels provide superior imprint and durability. Fixed die plates can be custom engraved to your specifications, including your signature or logo. Use for invoices, purchase orders, production orders, insurance claims, bank documents, property documents, police records, etc.